I can’t help it. Every time I think “skater dress,” this some comes to mind. I know, I’m terrible. It’s high school coming back to haunt me. I made McCall’s 6754 a few month’s ago, and I really like it. Well, I like the dress itself for its comfort, but the fabric is just meh. I finally caved and joined the Girl Charlee bandwagon, and oh man, I don’t think I can go back to JoAnn’s knit selection. 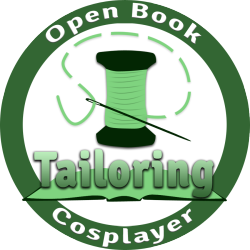 Alterations: Added 2″ length to bodice and 2″ length to skirt. Make it again? : Absolutely. I already have another one planned and on my cutting table! 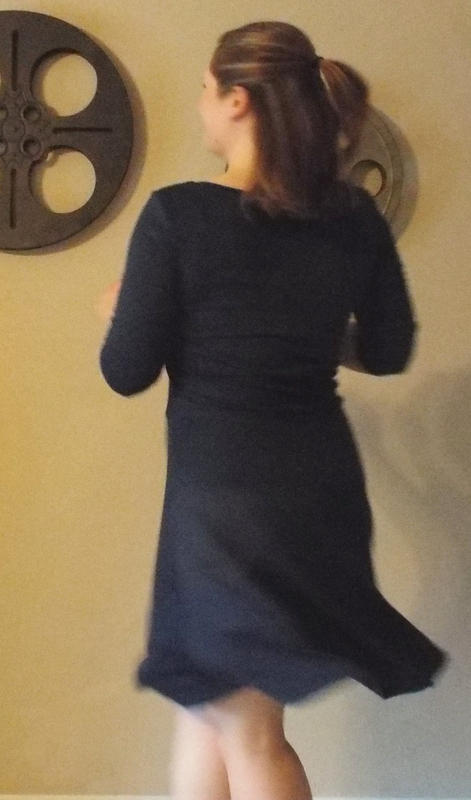 Favorite parts: Comfort, quick finish (around 3 hours using my BA serger), twirl-friendly skirt, flattering bodice. How many shots does it take to get at least one decent twirl photo? At least a half dozen. Other thoughts: I don’t know what I can say about this project that hasn’t been said a million times before. I absolutely love this dress. In fact, this may be one of my favorite projects so far this year. Since making it a week ago, I’ve worn it twice (once over the weekend and once to work), and I’m definitely making it a wardrobe staple. After the disaster that was my Moneta dress, I definitely felt the need to invest in quality fabric. I absolutely adore this ponte de roma. It feels better than wearing my pajamas! The recovery is fantastic, which is great for this particular pattern. The pattern is drafted for someone who’s 5’5″, so I automatically added 2″ to the bodice and 2″ to the skirt to accommodate my 5’11” frame. 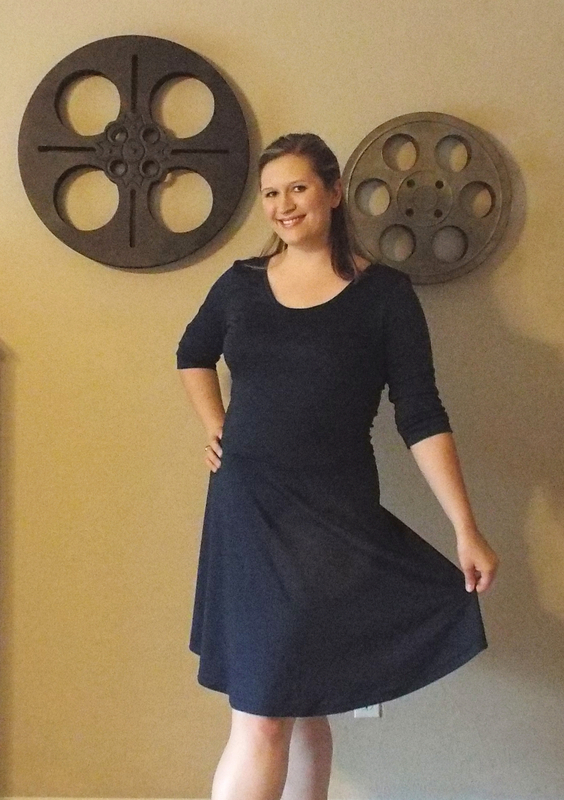 The overall length is perfect for wearing this dress to work. Yay comfy work clothes! However, this adjustment dropped the waist a little low for wearing belts, so in future versions, I’ll only add 1″ to the bodice and 3″ to the skirt. I may need to do a teeny swayback alteration as well, but I’m curious to see if shortening the bodice will remedy the back pooling situation. I thought that the neckband finish was an interesting touch on this pattern. Unlike the Renfrew (and the Moneta, if I remember correctly), you sew one shoulder, attach the neckline, *then* sew the second shoulder. I rather like this approach. It feels easier and a bit speedier to me. When it came to sewing up the side seam, I ignored the directions and took the flat sewing approach used in RTW fashion, assembling the entire front and back (including the cuffs) and then sewing everything at once. It leaves a little bit of loose thread on the edge, but no worse than any of my RTW clothes. I really like Kitschy Coo’s instructions on adding elastic. This is one of the areas where I got lost with my Moneta, but it feels much sturdier in this dress. Basting it in place with a zig-zag stitch makes so much sense! To hem my dress, I used my super awesome Wundertape to hold the seam allowance in place and finished it off with my twin needle. Super pretty hem for the win! 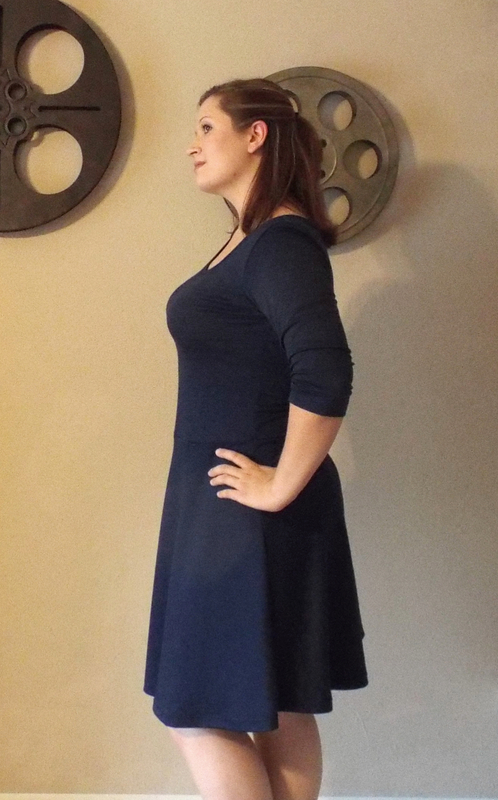 I also used my twin needle on the neckline for a more RTW look. 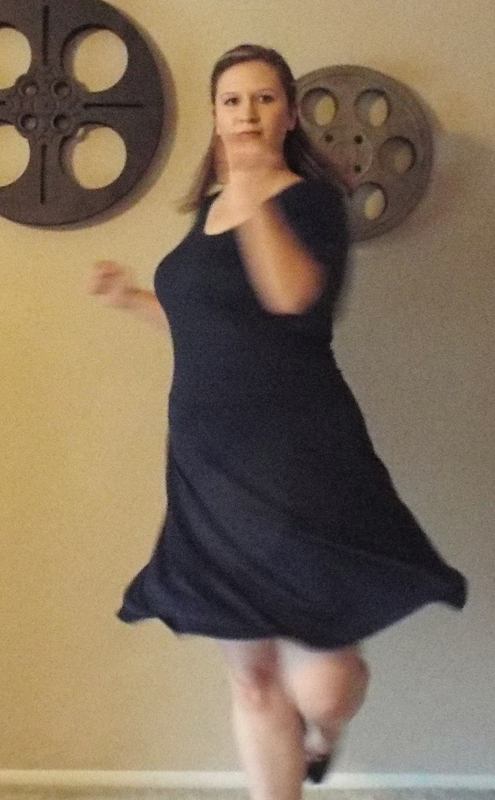 One more twirl for good measure. Overall, I’m very pleased with this dress. I’ve got a black and white polka dot ponte de roma (my September challenge to make up for missing the monochromatic theme) on my cutting table for a second take on this dress. Hopefully I’ll get it done this weekend. I still have about a yard of the blue for this fabric leftover, so I’m thinking another Mabel is in order too! Have you made the Lady Skater? What do you think about it? Comfy work clothes are the best. I know I am a sucker for twirly dresses! You did a great job. This dress is SUPER cute! I love it! Aw you look great! I love the twirling photos! Skater dresses/skirts are my favorite. Thank you, dear! I ❤ them too. So comfy! Haha, I did too! But I have no idea what is going on with that Hello Kitty song. What Hello Kitty song? Have I missed something??? Thanks, Jessica! Haha, I used to be obsessed with her as well.